Comprising 242,242 hectares, it was created in 1959 and declared a World Biosphere Reserve by UNESCO in 1978. 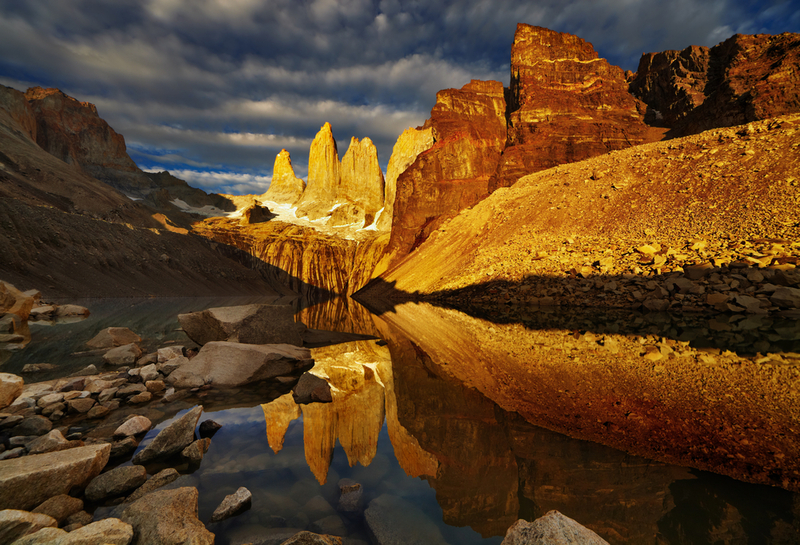 It is located between the Andes and the Patagonian Steppe. Puerto Natales, 144 km to the south of the park, is the nearest urban center. Its climate is unstable and in summer, even on sunny days, winds can reach up to 120 km/h. In spite of this, there is neither a very rainy area nor anywhere with a particularly heavy snowfall. There are three access routes: by Portería Sarmiento, Laguna Amarga and Laguna Azul. There are also seven park wardens’ stations where excursions and other activities are organized. There are four quite different types of flora in the park: the Pre-Andean scrub, which is adapted to cold and drought and is found primarily on the shores of Lago Sarmiento and Salto Grande; the Deciduous Magellanic Forest, composed mainly of lenga; the Magellanic Tundra, made up basically of mosses; and the High Altitude Desert, which has small shrubs that gradually peter out as the altitude increases. The Cuernos del Paine are also in the park, known world wide for their magnificent appearance: these gigantic rocky masses can be seen from the trails that cross the Park, providing a setting for the glaciers and the lakes dotted with ice-floesa and Lago Grey.